Oracles of the Bush is an annual event celebrating Australian bush poetry, music and art. This event boasts among the highest prizemoney for any bush poetry competition in the country. It includes a variety of events such as Poets’ Concert featuring professional poets, poetry competition heats and final, breakfasts, lunches and the Poets’ Brawl breakfast in Jubilee Park. As well as its signature events, a number of other community events such as a craft show, markets and the Centenary Cottage Museum display are held in conjunction with this four day celebration. 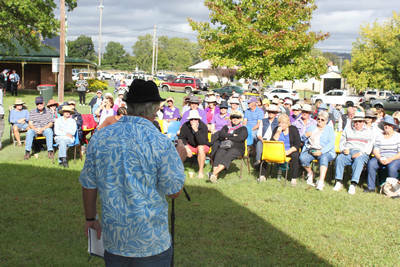 Oracles is held at the start of autumn when Tenterfield’s leaves are beginning to turn gold. It’s a great place to be at the start of a wonderful season. AbFab Tours owner/operator Debbie Bowling will hostess this tour. Debbie’s husband, Don will be on The ‘Oracles of the Bush’ Tenterfield Tour as well and together their goal is that everyone feels part of the AbFab family. Debbie Bowling: AbFab Tours Owner/Operator and Hostess – Debbie’s passion for all passengers to have a wonderful experience is reflected in this customised and personalised itinerary.